This past Memorial Day weekend was a blast. It was filled with family fun going to a baseball game, a day at the lake, and a birthday party. What could get better than that, right? With that said, I prepared plenty of food for the family to tailgate at the Brewers game, as well as serve up lunch and dinner at the lake. I made everything from Korean barbecue, to smoked ribs, to pizzas on the grill, and plenty of things in between. As I thought my Korean barbecue would still the show that weekend, I believe it was the homemade pizzas on the grill that really shined. As you probably have seen, I’ve been on a pizza kick now for some time. I can’t get enough pizza. At first I thought my go to food was tacos, but recently it has been coming up with all sorts of pizza creations. 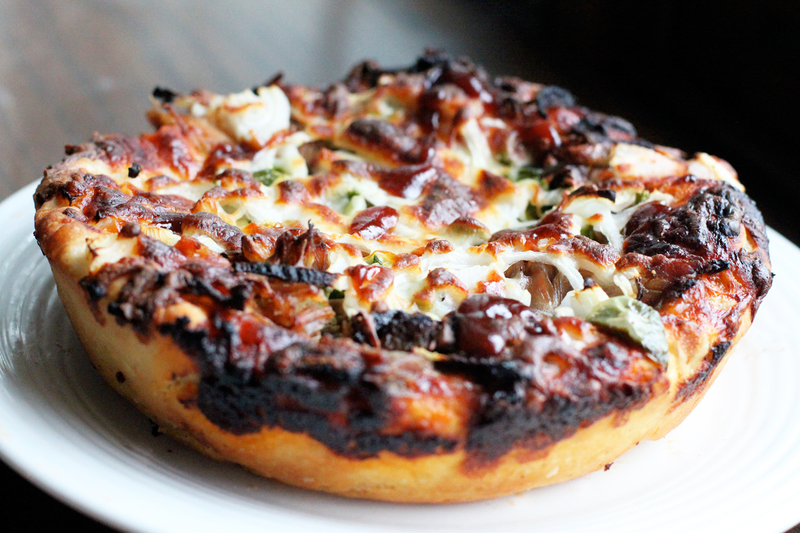 As I had came back from the weekend with a few leftovers, and realizing how awesome my cast iron skillet pizzas were on the grill, I set out to make more pizzas, including one that I could use up my leftovers, hence the BBQ pizza. As we were coning off of the long weekend, I decided to use what I could to feed the family after a long work day. That included leftover Korean BBQ, a salad with fresh vegetables and grilled chicken, BBQ ribs, as well as some fried rice. Yes, I set out to get rid of leftovers. As I had made some pizza dough the day before, not realizing we were going over to my in-laws for dinner, I wanted to come up with some pizzas for freezing for the week as well. So as they ate, I made pizzas. Let’s get started on this BBQ pizza. 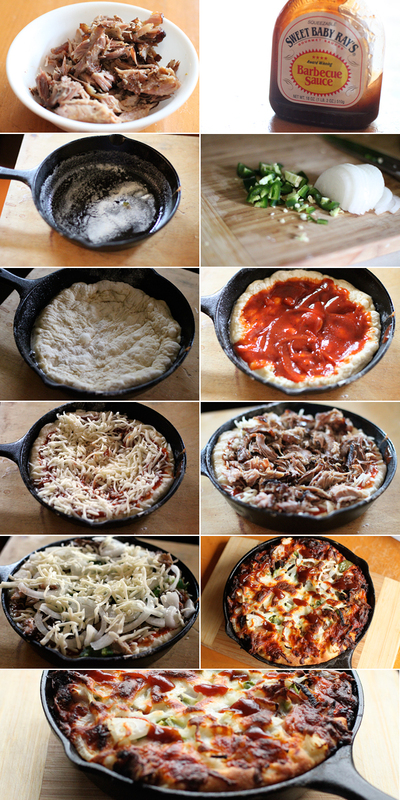 Now I have been making these cast iron skillet pizzas because for one they are awesome, and two, as much as I love a thin crust pizza, I also love a nice deep style pizza that has a crispy exterior and a really soft interior. Once risen, divide into three portions. With one of the portions, add some flour to a large pastry board, and take a portion of the dough, and form into a large enough piece to place in your cast iron skillet, just enough to have the dough come up the sides a bit. Preheat your oven to 475 degrees, and place your cast iron skillet in the oven to preheat. Once the oven is preheated, use kitchen mits to remove the extremely hot cast iron skillet from the oven. Toss in the butter, and give that a swirl. Add the portion of rolled out dough and place on the bottom of the cast iron skillet, being careful not to burn yourself. Try to push and form the dough just so it creeps up the edge of the skillet. Add the pizza sauce and barbecue sauce on top of the dough, and mix that with a spoon, covering the majority of the dough. Top with most of the shredded cheese, leaving a bit for the topping. Add the chopped rib meat, then top with the thinly sliced onions and jalapeño peppers. Top with any remaining mozzarella cheese. Use your kitchen mits, and place the cast iron skillet back into the oven, and cook for about 25 minutes. Around that time, take the skillet out, and run a butter knife around the skillet. Gently lift to make sure the bottom of the crust is golden brown. Once browned and the cheese is nice and melted, remove the pizza from the oven. Drizzle with a bit more of the barbecue sauce. Let the pizza rest for about 10 minutes, then carefully lift it out onto a pizza board, or cutting board before serving. Slice into wedges and enjoy. This pizza was pretty darn amazing. Not only will you fall in love with the crust, but biting into you get that sweet heat. I like barbecue pizzas to begin with, but that added jalapeño pepper, really balances out that sweetness, and smokiness of the sauce and ribs. If you are looking for a new pizza idea, and have some leftovers, or not, give this one a shot. I’m certain you will love it. How many do the skillet pizzas feed? They seem small, but heavy. Hi Kelly – the batch of dough will make roughly 3 cast iron skillet pizzas. That depends on your appetite. I cook mine in an 8 inch cast iron skillet. 4 wedges typically, or you could slice into 8 wedges. One skillet could feed one very hungry person, or a couple of adults and a few children. I typically make all 3 pizzas, making a different one, that way everyone can sample and there will be plenty to be had. But how many will one skillet pizza feed? This pizza crust was AMAZING! I’ve been trying to figure out how to make a pizza crust that was crispy on the outside and soft in the middle for about 5 years! Finally! Thank you for your recipe…the skillet and butter were a great, great idea! I haven’t tried the sauce yet, but it’s on my list to make! How long with the other two doughs last? I am single and making 3 pizzas at once isn’t really feasible. Hi Brandy – You can store the leftover dough in large ziplock bags, about 1/3 filled, in the refrigerator for days. Thanks! Does days mean I still have to make 3 pizzas in a week? Hehe, I will leave that one up to you. I will typically cook them, let them cool, then freeze them. That way I can warm them up in the oven when I’m in the mood for pizza. That’s an idea too! Thanks for the help. I think one of the three is gonna be a breakfast one. Yum! A couple of questions for you. For the sugar, is it 3/4 of a teaspoon plus a pinch? I’m not sure if I’m just missing it on the ingredients list. Also, if I were to make it in a 12in skillet, could I just split the pizza dough in half instead of 3? Hey Tara – Yes, it is 3/4 tsp plus a pinch. Feel free to try going in a 12 inch skillet, just make sure the dough is spread out. It can go as thick as you want it. Good luck, and enjoy! You say 3/4 plus a pinch of sugar. 3/4 teaspoon or 3/4 Tablespoon? Sorry Jill… It’s a 3/4 tsp sugar, plus a pinch.